Almost 20 years ago, a very popular all male Hip Hop group was formed in Seattle, WA called Baneful Brew – “Poisonous Medley of Style.” Now, under the creative and choreography direction of Elm “Elmboogie” Pizarro – original creator of Baneful Brew (est. 1992) and world renowned Boogiezone Global Dance Community, a new brew of talented young boys have been assembled for the purpose of entertaining the masses! This group of boys ranging in age from 12 to 15 years of age, were each hand picked and brought together specifically to carry on the name, tradition, and legacy as the 2nd wave of Baneful Brew. The boys, Dylan Sheperd, Kennedy Bagnol, Kris Wagner, Nathan Sanchez, and Will Simmons are no strangers to the entertainment industry having several TV shows, movies, commercials and live performances to their credits. Creating original and cleverly executed dance concepts is their forte and definitely sets them apart. They are also proficient in many forms of dance, in both technical and street styles, often incorporate tricks and tumbling into their act, and most of all are guaranteed to deliver a powerfully energetic performance filled with lots of charisma and personality! 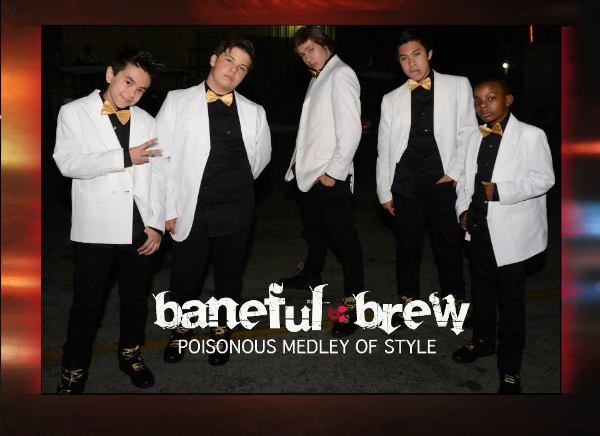 Introducing Baneful Brew – Poisonous Medley of Style! Dance Mogul Magazine is dedicated to providing our youth with the proper resources to help them succeed. Dance Group Baneful Brew is focused and ready for success. With the support of their parents their vision, mission and purpose is clear. We wish them all the best in all they do.